A holistic and practical approach to satisfy today's energy saving requirements can deliver more than just cutting waste and improving efficiency for manufacturing industries. During the past decade of intense industrial growth, environmental concerns have not been the primary focus of most manufacturing industries. There are now strong initiatives within energy intensive industries such as steel, chemicals, aluminum, paper, glass, foundries, food and beverage, ceramics, cement and extraction to use inverter drives to reduce energy consumption. The major effort within industry is concentrated on reducing the amount of energy consumed by pumps, fans and compressors, usually by fitting inverter drives to control speed and improve torque response, while also reducing off-load running. This approach is still highly creditable. The concept of 'Environmental Manufacturing' from Mitsubishi Electric however can be taken much further, Mitsubishi has a complete range of automation equipment that can be applied to gain the maximum benefit in any industry, allowing efficiency gains to be spread far wider. For example, Mitsubishi Electric's FR-F700 series of power-saving inverter drives - manufactured in common with all Mitsubishi products in ISO 14001 accredited factories - can produce savings of up to 57 per cent compared with conventional drives, when used on variable torque loads such as fans and pumps. With a major proportion of industrial electricity consumption (around 40 per cent) utilised as the motive power for electric motors that drive pumps, fans and compressors, savings of over 50 per cent on motor running costs are a major contributor to reducing a company's carbon footprint. They also reveal the scale upon which energy is wasted unnecessarily, giving a clue to the wider application of ac inverter drive technology in more secondary areas of production such as conveyors, mixers and machine tools, which do not immediately suggest themselves, but can also provide useful savings. Before moving into these secondary areas and exploring the benefits of synergised control, it is appropriate to consider another, newly emerging drive feature that acts not just to reduce energy consumption, but to reverse it, this is regeneration. The regeneration feature is integrated into Mitsubishi's new FR-A741 inverter drive to improve its braking performance. The FR-A741's regenerative braking system makes it much more efficient than conventional drive systems, giving it the potential for significant energy savings. 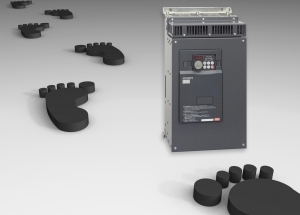 It also helps to keep operating costs low, and makes possible the use of smaller and much less expensive drive systems, and simpler and more compact switchgear cabinet layouts. The FR-A741's regenerative function works by feeding the energy generated by braking back into the power grid. This has the effect of generating much less heat than with a braking resistor, eliminating the need for cooling hardware. However, the prime benefit is that energy fed back into the grid can be used for other purposes, reducing overall power consumption and operating costs substantially in many high torque applications; typically hoists, conveyor systems, centrifugal separators, testing machines, winding machines and elevators. When used as proprietary items, inverter drives can, on their own, produce major savings in energy in certain market sectors. But what about the wider manufacturing area where savings are not so obvious? Well, here the focus has to be on such factors as Quality Improvements: reducing the number of rejects to reduce energy in rework and waste generated; on Increased Productivity: manufacturing the same product with reduced levels of energy, to achieve a lower unit cost per item; and on Improved Efficiency. 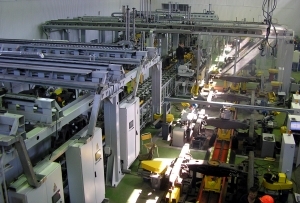 Improved efficiency can be achieved in a number of ways: by replacing repetitive manual tasks with robots; by using servomotors in place of standard motors for improved response and precision; by ensuring the correct alignment of mechanical couplings, belts and chains, and by providing adequate lubrication. Checking a drive system right down the power train makes economic sense as a poorly maintained mechanical drive can reduce operating efficiency by as much as 5 per cent. The key environmental objectives of improving efficiency and reducing waste - and, it must be said, improving quality - can be achieved using robotic technology. This is evidenced by a recent application, at Rodinger Kunststoff-Technik (RKT) GmbH in Germany. At this company, Mitsubishi Electric articulated arm robots are used to handle delicate moulded parts, in order to prevent expensive wastage, which could otherwise be substantial with the company manufacturing around 500 different products, and undertaking production runs of between 100000 and a million units per annum. As well as preventing waste, the robots (RV-6S units) have increased efficiency by improving production rates by 10 per cent at the injection moulding plant. This improvement results from faster removal of parts, despite the fact that in some cases the 15 - RV-6S robots have to remove up to 48 parts simultaneously and place them precisely in a variety of different size recesses. Robotic technology is also playing a similar role, although this time as one key component in a series of optimised automation packages developed by Mitsubishi Electric to improve the performance, efficiency and quality throughput of flow pack machines. 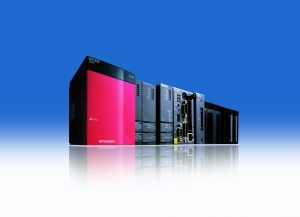 The packages, for Low/Medium, Medium/High and Ultra-High production flow pack machines, integrate the benefits of Mitsubishi Electric's ac drives, servo systems, PLCs, motion controllers, HMI's, virtual software and - in the case of Ultra High production machines - vertical robots, to provide machine users with the maximum flexibility and repeatability in operation, to obviate errors and waste. By the very action of integrating these products Mitsubishi Electric is producing a synergy of operation that is greater than the sum of the discrete components involved. Although designed primarily to improve the overall performance of the flowpack machines, this synergy produces efficiencies in operation that also benefit the environment, through more efficient use of materials, reduced wastage, improved quality and reduced use of energy. 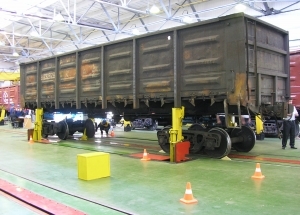 Another highly relevant example of using synergised automation technology to achieve higher production efficiency and therefore improved energy efficiency is at Russian Railways Magnitogorsk repair depot which has increased productivity by 100 per cent, repairing over three thousand more freight carriages per year. Using the software and hardware integration capacity of a Mitsubishi iQ Automation Platform to automate an entire section of the rebuild process, all the benefits of Environmental Manufacturing can be brought together. 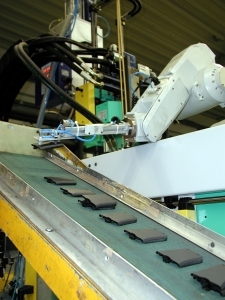 The system integrates RFID tracking, welding robots, CNC milling machines, parts handling and production line conveyors. The iQ Automation Platform provided an solution to draw all the disparate elements of the repair process together. It is a multifunctional, multi-CPU platform designed for complex automation tasks using a single approach to both hardware and software.